At Rocket Auto Repair, our ASE certified technicians are able to perform a wide variety of services for your car, truck, or SUV. No matter what make or model, your vehicle is in great hands with our amazing 24 month / 24,000 mile warranty! We proudly stand behind all of our services and take pride in every repair we perform, which is why we are able to make such a bold warranty. Bold like the free coffee in our Monmouth waiting room – if thats your cup of tea – that you can enjoy while you wait. From engine repair to exhaust repair, we do it all. Our spacious, state of the art maintenance facility in Monmouth allows our ASE certified team the time to get to know your vehicle and treat it with the proper care that it deserves. Every service we offer is done correctly the first time in order to guarantee your safety and satisfaction. Some of our preliminary services include transmission servicing, exhaust, oil changes, check engine light diagnostics, and timing belt replacement. We also offer a local pick up and drop off service for your convenience to get you where you need to be in your busy schedule. 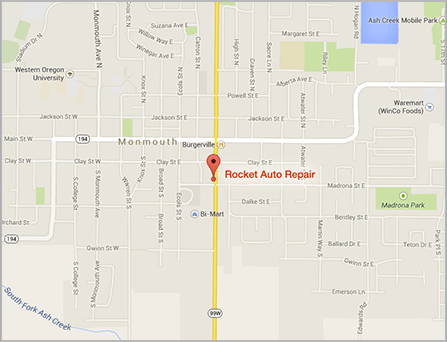 Walk-ins are always welcome at Rocket Auto Repair! Your vehicle is like your body. If you feed it the right nutrients it will be in great shape. At Rocket Auto Repair, we believe in giving your vehicle the best service possible to make sure it is always running smoothly and like-new. Our preventative maintenance will keep your vehicle in tip top shape and will save you money in the long run from avoiding costly repairs due to neglect. We appreciate the fine craftsmanship behind every vehicle and we perform every repair and service with passion, whether it be a simple oil change or a transmission repair. Take your automobile to Rocket Auto Repair in Monmouth today to get your vehicle serviced by our team of expert, ASE certified technicians! We are thrilled to work with you to answer your questions and work within your budget to get you back on the road and back to running smoothly.